As a parent, it is often hard to know if a child’s hand injury is just a sprained wrist or if it is broken. Broken wrist symptoms include pain when trying to flex the wrist, swelling, tenderness, and bruising. Broken wrist symptoms can also cause the wrist to look deformed, bent, or crooked. If your child complains of a sore wrist, you might want to see the doctor and have an x-ray done just to be sure. In cases where the nerves or blood flow are affected by the injury, broken wrist symptoms may include pale fingers, numbness, or extreme pain. In some cases, a piece of broken bone will poke through the skin, adding to the list of broken wrist symptoms. When doctors refer to a broken wrist, what they generally mean is that the larger bone in your forearm has broken close to where it connects to the hand. This is also known as a distal radius fracture or a Colles’ fracture. The doctor will perform a visual examination of the wrist. X-rays can confirm the nature and severity of the break. The doctor may have to reset the bone so that is positioned correctly for healing. Next a splint is used to immobilize the bone and joint until the swelling subsides. Once the swelling is reduced, a cast will be placed on the arm. The doctor will take regular x-rays to make monitor the progress of the healing. In more severe cases, you might need the services of a surgeon. Hand surgeons are skilled at using pins and plates to restore the bones to their proper position to help with healing and restore function to the hand and wrist. 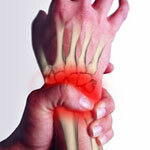 As with all surgeries, there are possible wrist surgery complications. Infection is one of these complications. After surgery, it is important to follow the doctor’s instructions and to have your child complete all prescribed physical therapy.